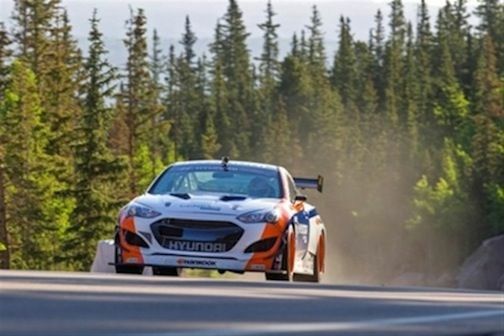 The Hyundai Genesis Coupe has done it again this year by setting a new world record run to the summit of Pikes Peak. Records are meant to be broken, and Paul Dallenbach has shattered the old world record at Pikes Peak in the Time Attack Class set by the same car last year. The Hyundai RMR Genesis Coupe driven by Dallenbach set a blistering pace to the top of the 14,115 foot summit in only 9:46.001. This broke last years record set by teammate Rhys Millen. But the Genesis Coupe isn’t exactly the same car that set the world record last year. It may look identical, but the Rhys Millen Racing-prepared Hyundai RMR Genesis Coupe received a few tweaks and upgrades to make the race car even faster. Last year, Millen an 18-year PPIHC veteran, beat Switzerland’s Romain Dumas’ time in his 2012 Porsche GT3 RS by 0.02 seconds driving his 2012 Hyundai Genesis Coupe. This year, the car received a few strategic upgrades to quicken its pace. It got a new clutch-type rear differential to help reduce inside wheel spin in the tight hairpin turns up to the summit of Pikes Peak. The team saw they could improve those turns with extreme crown affecting corner-exit acceleration. They also staggered the tire sizes even more using a smaller overall diameter for the front tires. This change helped increase rear-to-front rake and increased the front tire-patch weight balance, reducing understeer. The Rhys Millen Racing team also used stiffer rear springs to further reducing understeer for more perfect balance. The second-oldest motorsports race in America got a new look last year when the famous race course was fully paved for the first time. Before last year, it took 95 years for a driver to break the once allusive 10 minute barrier. Now it will be interesting to see how long it takes to break 9 minutes. Until then, Dallenbach and the Hyundai RMR Genesis Coupe holds the world record time of 9:46.001.